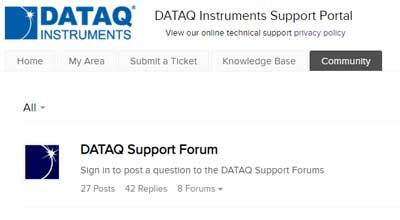 DATAQ Instruments Technical Support Forum - get support for Hardware, Software, Starter Kits, and ActiveX programming. If you would rather e-mail your support questions, you can reach an applications engineer at our Support Email. However, please note that priority is given to the support questions in the DATAQ Forum. In your e-mail, please include the software and hardware you're using, your operating system, your data acquisition interface (parallel port, ethernet, USB or serial) and a description of your problem. This forum is no longer moderated. Search through our old support forum at support.dataq.com to find technical fixes to your device from 2015 or earlier. Contains a large database of programming support questions.